The Lawfare Project, assisted by UKLFI, is taking legal action against what experts and advocates are describing as the most aggressive boycott measure targeting Israel in European history. If it becomes law, the bill could have significant implications for major American companies with Irish divisions or subsidiaries, such as Airbnb and Apple, whose global sales outside the United States are taxed in Ireland, and whose Irish subsidiary, “Apple Distribution International LTD”, paid $1.5 billion Irish corporation tax from 2014–2016. 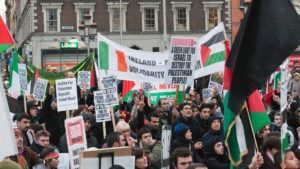 Complying with an Irish ban on commerce with Israeli settlements would violate U.S. anti-boycott laws, which require American firms to refuse participation in foreign boycotts that the U.S. does not sanction, and could result in substantial fines for those companies. When the bill was debated in the Irish senate earlier this year, The Lawfare Project’s Spanish counsel, Ignacio Palacios, filed a complaint—which garnered wide circulation—arguing that the Irish bill, if enacted, would violate foreign trade competences that belong exclusively to the European Union. In the aftermath of Wednesday’s vote, The Lawfare Project will continue to pursue legal action: Palacios will submit further arguments, developed together with Jonathan Turner of UK Lawyers for Israel.